I awoke the other morning with an odd craving (no I'm not pregnant). I wanted bacon. And sweet potatoes. Together. For the life of me though, I cannot tell you where this came from. I'm not one of those people who have a Pinterest board dedicated to bacon, and I've eaten sweet potatoes probably ten times in my entire life. But I fully support the indulgence of a craving every now and then, and I didn't really feel like unpacking the deeper meanings behind that day's craving (sodium deficiency? too much stress and too little sleep? daddy issues??). So I went to the grocery and bought myself a giant sweet potato and a package of thick-cut bacon. And then I bought a huge thing of fresh spinach, because I figured it couldn't hurt to add something from a different part of the color spectrum to my lunch. Because, you know, healthy and stuff. *Wash, peel, and slice the potato into small cubes. Lay the cubes evenly on a foil-lined baking sheet. 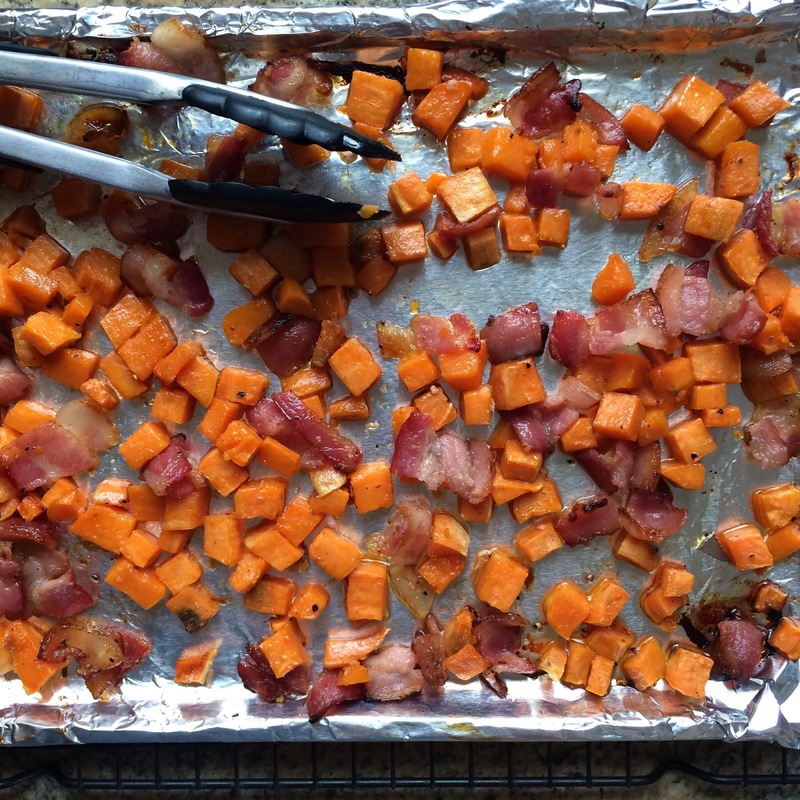 Cut the bacon into 1/4" pieces, and lay those amongst the sweet potatoes. Drizzle with olive oil and honey, sprinkle with salt and pepper (there's a lot of salt already in the bacon so don't go overboard here), and roast at 375 degrees for 20-30 minutes, or until the bacon is beginning to brown and the potatoes are soft. Halfway through the roasting process, flip the bacon and potatoes to ensure even cooking. *Place the cooked bacon and sweet potatoes atop a large pile of fresh spinach. Add the cranberries, walnuts, and (if you're like me) just a bit too much feta. Feel free to toss the salad with your favorite oil and vinegar dressing, but honestly there was so much flavor from the rest of the ingredients that I didn't even use a dressing.